Bus 287 (ca. 20 min. from central station): Take bus no. 287 in direction of “Sebaldussiedlung”. Get off at the bus stop “Technische Fakultät”. Please note that some buses do not operate during semester break from March 1st to April 30th and from August 1st to October 31st. Bus 30/30E/295 (ca. 20 min. ): Take bus no. 30 or 30E in direction of “Nürnberg/Thon” or bus no. 295 in direction of “Tennenlohe”. Get off at the bus stop “Erlangen Süd”. Cross the bridge. 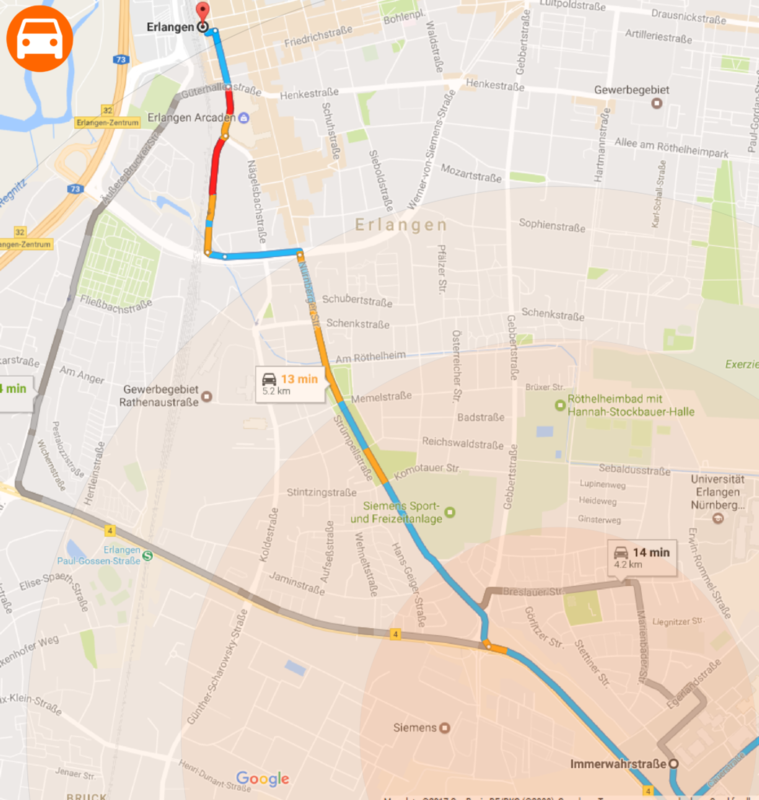 After 50 meters you will get to the intersection Egerlandstrasse / Haberstrasse. 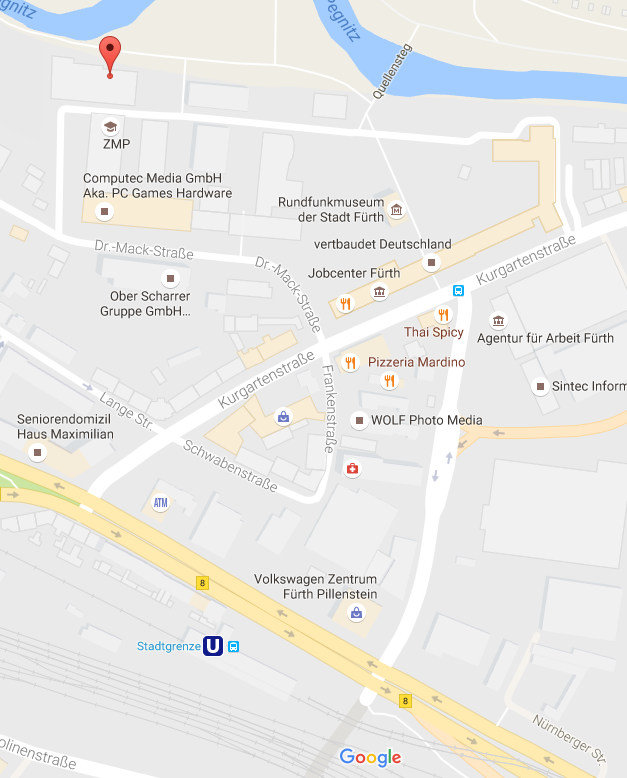 Turn right into Immerwahrstrasse, our officebuilding is on the right side. 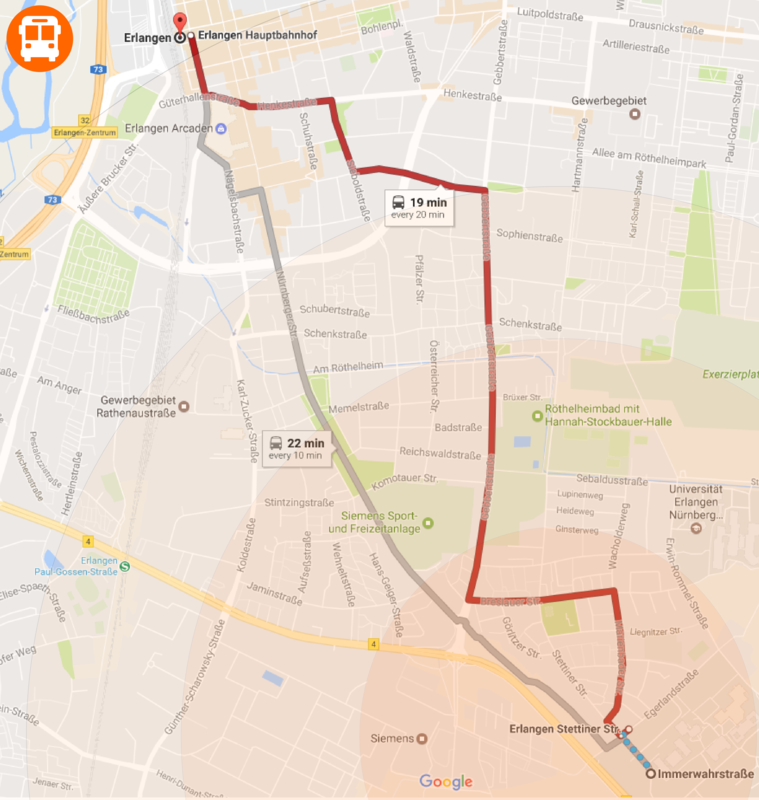 An additional map is provided for going by bus. A3 from Munich or Würzburg: Take the exit Tennenlohe and then the B4 to Erlangen. Take the exit “Universität Südgelände”. Turn left after the exit in direction of Erlangen or “Südgelände” respectively (Kurt-Schumacher-Str.). Keep straight on until you can turn left into Erwin-Rommel-Strasse. Turn left into the Egerlandstrasse and keep straight on until the very end, where you turn left into the Immerwahrstrasse. A73 from Regensburg or Nuremberg: Take the exit Erlangen-Bruck and turn in direction of Nuremberg. Follow Paul-Gossen-Strasse until you leave Erlangen. Take the exit “Südgelände” or “Gräfenberg” respectively. Turn left into Kurt-Schumacher-Strasse. Keep straight on until you can turn left into Erwin-Rommel-Strasse. Turn left into the Egerlandstrasse and keep straight on until the very end, where you turn left into the Immerwahrstrasse. An additional map is provided for going by car. 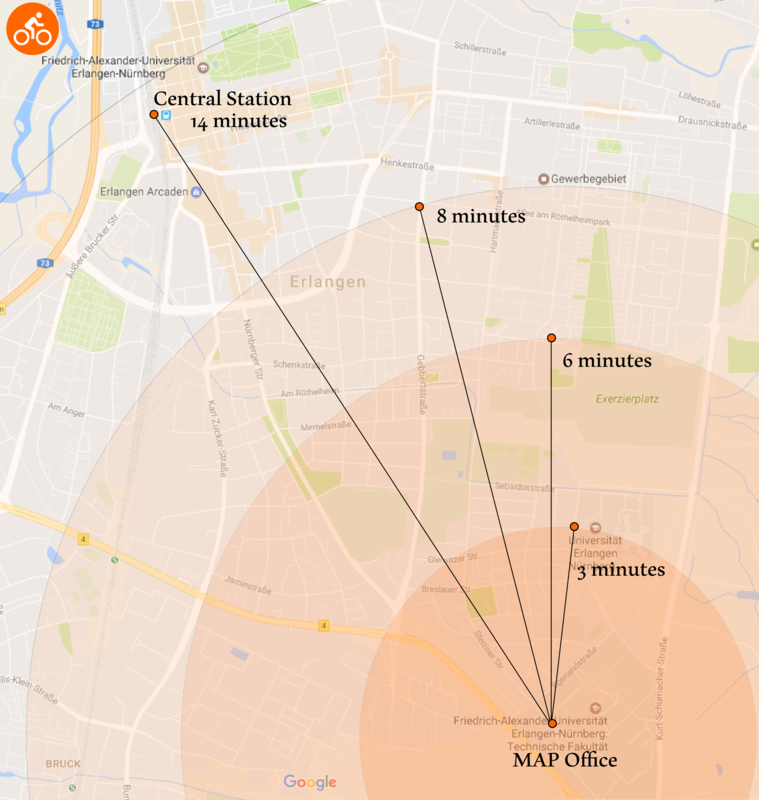 An additional map is provided for going by bike. 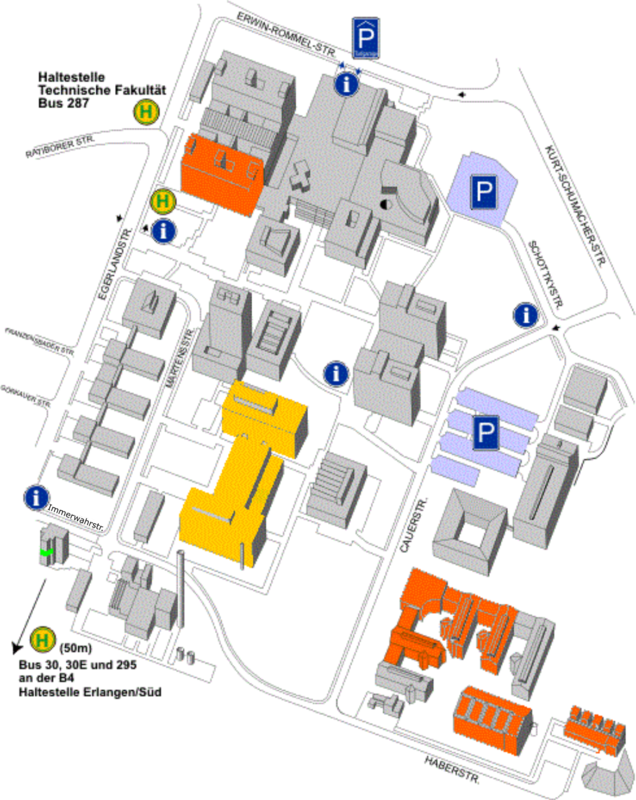 The area map below shows the Technical Faculty of the University of Erlangen. In the orange buildings you will find the chairs belonging to Chemical and Bioengineering (CBI), in the yellow ones the chairs belonging to Material Science (WW). In the green one you will find the office of the elite graduate program “Advanced Materials and Processes” (MAP). The Chair for Bioprocessing of the University Erlangen-Nuremberg is situated on the Röthelheimcampus in Erlangen. The Chairs for Bio Processing, Chemical Processing and Polymer Engineering of the University Bayreuth are located in the building sections A and D of the School for Applied Sciences (FAN) on the campus Bayreuth. 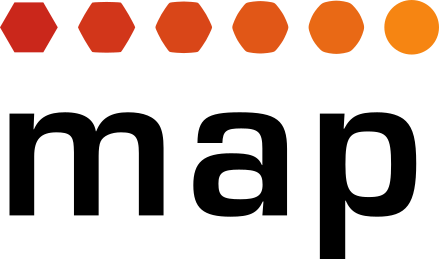 The Chair for Metal-Based Materials is located in Prof.-Rüdiger-Bormann-Str. 1. The Chair for Technical Physics of the Julius-Maximilian-Universität Würzburg is situated on the university campus. The Institute of Materials Simulation (WW8) hosts several MAP lectures.